“buffalo wing”. Generally prepared fried, with crispy delicious, skin, and all, then immediately tossed and served in some spectacular buffalo sauce and served with some celery and ranch or blue cheese, depending on my mood. Some of my favorites of all time include Buffalo Joes in Evanston, Wings and Curls in Ocala, Florida, and the original Vine in Iowa City. But the truth is, you can make great chicken wings on the grill at home. Its healthy, a fraction of the mess, no clean up, and doesn’t require a fryer, which most people don’t generally have or aren’t comfortable using. 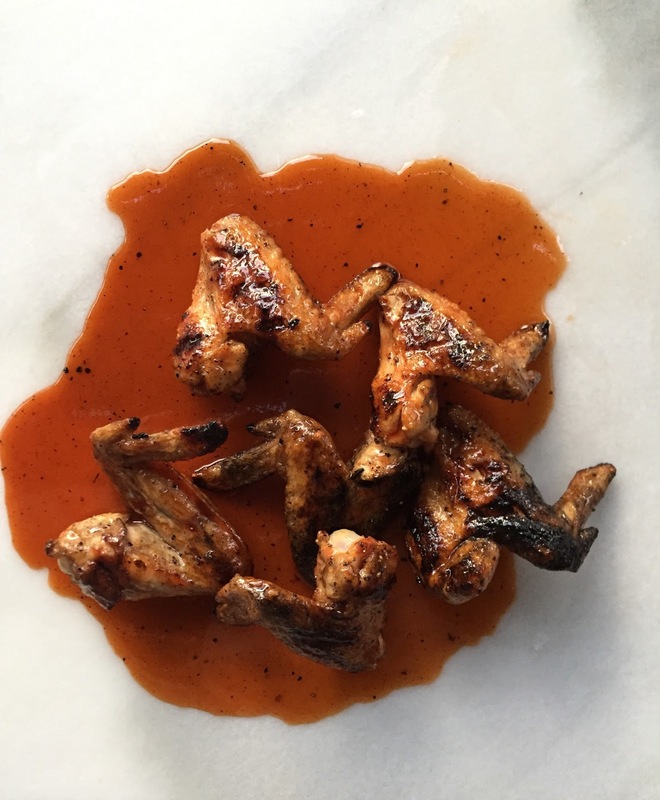 The preparation for the chicken wing is exactly the same every time, and then you can change up the sauce you are tossing it in, to create completely different and unique tasting wings. I urge you to explore outside of just “buffalo style”. You are going to need some chicken wings. You can find them at pretty much all grocery stores, but, as always, if you can afford it I recommend buying some high quality wings from your local butcher. Marianos, Whole Foods, and other mass merchant grocers also offer an organic high quality wing too, if you ask for it. The difference in quality as compared to a cheap chicken farm wing is tremendous. Not only will the meat be so much more ample and succulent, but it will be void of all the tendons and grossness you will find from cheap poultry farm chicken. I like to buy the 3 piece wing, with wing tip still in tact. It makes them easier to grill and handle, and I enjoy tearing the pieces apart as I’m eating. I think each part has different delicacies to enjoy. But this is complete personal preference, and you can ask the butcher to cut the wings at the joints when you buy them, or just to remove the wing tips, or whatever you want. However you get them, you are going to want to rinse them down with water, pat them completely dry, and then generously toss in coarse salt, pepper, and olive oil. That’s it! Make sure the wings have had a chance to come down to room temperature (or close to it) before throwing them on the grill. The key is to make sure the grill is super hot (450+ degrees). The hotter the better. Put the wings on the grill, and close the lid. Keep closed and hot. You can check on them every few minutes to make sure you aren’t flaming up too bad anywhere. You are going to want to leave them without turning for around 10 minutes. After 10 minutes, turn them over and cook for another 10 minutes with lid closed. Again, check on them every few to make sure you don’t have too much fire. If you know certain parts of your grill are hotter than others, you may want to rotate the wings around a little bit. After about 20 minutes of grilling, check to see how they look. The skin should be good and charred and crispy. Its almost impossible to overcook wings. Cooking time will vary 20 -30 minutes depending on heat. Once they look delicious, you can pull them off, and eat them “as is” or…. Toss them in your favorite sauce and Enjoy! You will be thanking me…. Spicy maple sriracha chicken wings are the perfect balance of sweet and spicy! Prepare on the grill for a delicious twist on the traditional Summer favorites or bake on game day for the perfect game watching snack. In a larger bowl combine wings, salt, coriander, cinnamon, cumin and olive oil. Stir until well blended. Chill 1-4 hours. Heat oven to 400 degrees. In a bowl combine maple syrup, sriracha sauce, butter, ketchup, lime juice and zest; set aside. Bake 30 minutes until cooked through and crispy. Remove from the pan and toss in maple mixture. Return to baking sheet. Spoon any extra sauce onto the wings. Bake 20 minutes, until crispy and sauce is set. However you get them, you are going to want to rinse them down with water, pat them completely dry, and then generously toss in coarse salt, coriander, cinnamon,cumin and olive oil. In another bowl combine maple syrup, sriracha sauce, butter, ketchup, lime juice and zest; set aside. Make sure the wings have had a chance to come down to room temperature (or close to it) before throwing them on the grill. The key is to make sure the grill is super hot (450+ degrees). The hotter the better. Put the wings on the grill, and close the lid. Keep closed and hot. You can check on them every few minutes to make sure you aren’t flaming up too bad anywhere. You are going to want to leave them without turning for around 10 minutes. After 10 minutes, turn them over and cook for another 10 minutes with lid closed. Again, check on them every few to make sure you don’t have too much fire. If you know certain parts of your grill are hotter than others, you may want to rotate the wings around a little bit. After about 20 minutes of grilling, check to see how they look. The skin should be good and charred and crispy. Its almost impossible to overcook wings. Cooking time will vary 20 -30 minutes depending on heat. Toss them in your maple syrup sauce and Enjoy! You will be thanking me….